In a market that is certainly starting toughen up, mainly due to a lack of people looking, it is so important to make sure that you chose an agent who will have the ability to make your property stand out. Media is becoming more and more geared towards HD and clarity, it baffles me how estate agents are failing to realise that a professional standard set of pictures for their properties is vital, to achieving the highest price for their client. But I guess more importantly it baffles me how people selling their properties with such agents accept the poor presentation, of what generally is their largest asset. Surely, in order to get the best possible price you have to present the property in its 'best light'. I strongly believe that good estate agency practice means that everything should be done to secure the highest price for the seller, the client. In achieving that highest price agents must advise sellers how to present their properties correctly. Every morning I look at other properties that have been uploaded to various web sites in bemusement. Bedrooms with the washing pile clearly displayed and dumped in the middle of the bed, bathrooms with toilet seats up and a range of products on the window sill that would be the envy of any supermarket and the main front picture with all the many council bins we have strewn all over the lawn. These images will not secure the best price and should not be accepted by sellers. As agents, we should not allow these low standards to happen and it's no surprise that the best presented properties get the most interest and therefore the best offers from potential buyers. Anyone can buy a camera, point it at a house or a room and take a photograph, but in a more competitive market it just isn't good enough. Make sure when choosing an agent that they have the highest of standards towards presentation and that the photography package is included within their fee and is not an extra cost. We believe that tripods should be used to make sure the images are as clear and as steady as possible. There are plenty of software packages out there that do not cost a penny and these should be used by agents to 'layer' the photos. Layering means that over and under exposed shots are taken in order that when looking at the finished layered picture you can actually see through the window into the garden, which would normally be a bright white blur without any perception of the outside space. As long as it's used properly layering will also give a clearer shot of a room or garden with the correct colour balance. Using a wider angle lens is also a great way to give perspective and flow of a property. I've had many people comment that a wide angle lens is deceiving, but as long as there are accurate room measurements and a professionally designed floor plan this objection is easy to overcome, explain and people understand it. Using a poor quality camera will not show the full flow of one room leading into another because it simply doesn't have the capability nor the lens to show enough of the house and the automatic setting will not give your property the correct lighting and exposure. Ask the agent if they enhance their front picture. 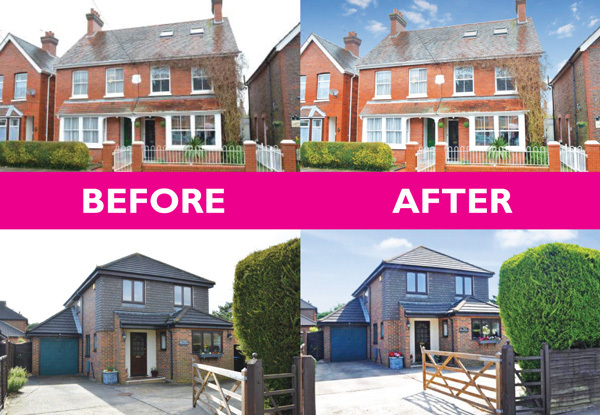 Enhancing the front picture will cost the agent money so ask them if they spend the extra money to make sure the first picture that buyers see is of the best quality with seasonal blue sky and lighting as well as an overall sharper image. It's not just photos that make up the presentation. A recent survey showed that 72% of sellers looking to come to the market would not use an agent who did not use a floor plan. Much like photos there are some poor examples of agent's floor plans out there and sadly they are accepted as adequate and 'will do'. Make sure you use an agent whose floor plans are of high quality. After the front picture the floor plan is most commonly the next thing that the buyers will look at, so make sure it gives them an impression of quality as that's how a seller should want their property to be presented. The floor plan is not something that needs to become an extra cost either, ask the agent if the professionally prepared floor plan is within their fee; it should be. Judge the agent on how they present their property stock. Don't just look at how they present their properties on the major websites and newspapers but do actually take a look at the agents own independent company web site, this will tell you so much. If the agent takes the time to update their site and has spent valuable time and money and on it, it will generally be a good indicator as to the company standards, how your property will be presented and how you will be treated. But do remember, when the market gets tough you will need than extra edge.